Please note the shipping policies and notification on our home page. 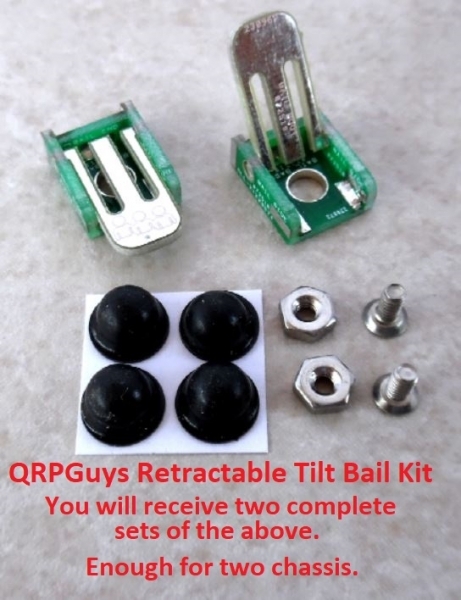 From a user request, we are offering a retractable tilt bail kit for your project cases. You assemble it by soldering pcb pieces together to form a retractable foot and attaching them to the bottom of your project case. We supply parts for four complete retractable feet, enough for two chassis, with all the #4 mounting hardware, and rubber bumpers that will allow the bails not to touch the table surface when the feet are retracted. The base size of an individual foot is 1/2″ wide x 5/8″ long, and have a collapsed height of 3/16″. The retractable feet permit the front of your chassis to be raised about 5/8″ to 3/4″, depending where you mount the bails and the depth of your chassis. You mount the bails with the supplied #4 S.S. hardware, drilling a 1/8″ diameter hole in your chassis. If you choose not to drill your chassis, you may use two sided tape, or adhesive to attach the feet. The foot assembly is joined by soldering the pcb pieces together using the same technique as our other projects. On a difficulty scale of 1 to 5, 5 being the most difficult, this is rated at 2. Assembly time is about an hour or so, depending on your experience.